Europlate member (#62) Dr. Marcello Gallina has now published his new book on the history of the Vatican State registration systems. Carlo Bellini has collaborated in the production. That’s Bellini, not Fellini, chaps! I was able to obtain two copies of the English-language version last week via a pal who was over in Italy and liaised with Marcello. 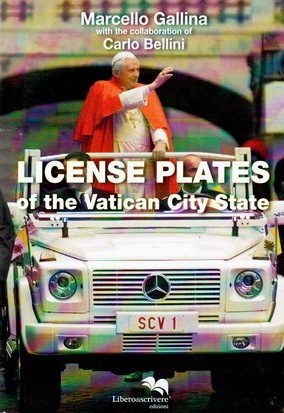 It is a very detailed, 170-page work, with 200 black-and-white photographs of Vatican plates old and new. He plans to be at the Easter Europlate Convention near Milan. This entry was posted on Wednesday, December 7th, 2011 at 8:33 am and is filed under Useful publications, Vatican. You can follow any responses to this entry through the RSS 2.0 feed. You can leave a response, or trackback from your own site.